M Barnwell Services are the UK’s leading stockist, distributor, and manufacturer of PTFE Seals. With over 40 years experience and industry-leading technical support, our customers can be confident that they will receive the correct product for their application. 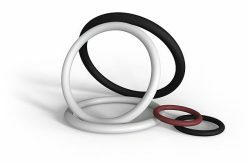 In comparison to standard sealing solutions, PTFE seals can present further distinctive features. The most important of these features is low friction at high pressures, however, when designing longlasting and dependable sealing systems other important factors to take under consideration are high abrasion resistance, extreme chemical compatibility, and low stick-slip. PTFE’s sealing efficiency is usually poorer than that of a standard elastomer solution. For an efficient system operation, it’s crucial to carefully consider the general specification. For more information, please contact our team of seal experts. Oil Seals - Over 9000 sizes of Rotary Shaft Seals are available from stock. Metric sizes range from 4mm to 480mm shaft diameter. Imperial range from 1/4" to 19" shaft diameter. Many more specials made to order. Hydraulic and Pneumatic Seals - Over 8000 sizes available from Metric 3mm to 1800mm and Imperial 1/8" to 71". Special sizes available from our SealMaker manufacturing service. Oil Seals - Styles - Rubber Covered, Metal Cased and Totally Metal Enclosed. M Barnwell Services Types - DIN3760, A, B, AS, BS, S, SAS, L, ABG, BG, G, EXT-R, EXT-L, SP, ADP (Hydrodynamic Lip) & High Pressure, Combi, & Cassette Oil Seals (Please refer to catalogue). Hydraulic and Pneumatic Seals - Comprehensive range of Rod, Piston and Wiper Seals for both single and double acting cylinders including: Pressure Seals, Buffer Seals, Vee Packs, U Rings, Guide Rings, Wear Rings, Twin Sets, Cup Seals, Dri Rod Seals, Fluid Seals, Chevron Seals, Internal and External Distributor Seals, Hat Seals, Wyclips, Energised Seals, Solosele Seals and many more. O Rings - British Imperial (BS1806) and Metric (BS4518). European Metric (ISO 3601), including German (DIN 3771), Swedish (SMS 1586/1588) and French (NFT 47 501). American (SAE, AMS, AS568) and Japanese Metric (JISB 2401).